EQUIPMENT RENTAL We have what you need! 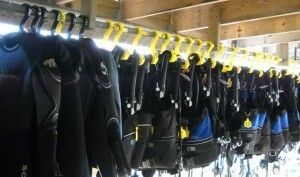 The Olympus Dive Center Rental department features Scubapro BCD's and regulators. All of our rental regulators include an alternate air source and gauge console. We also maintain a variety of 3mm and 5mm wetsuits and accessories. Both 80 and 100 cubic foot tank rentals, filled with air or nitrox, are available. Additionally, we offer Scubapro Nitrox dive computers for rental. Olympus offers Hero 4 & Hero 5 GoPro Cameras and SeaLife DC2000 for rent! Please bring your own micro SD card for use in our rental GoPro & Sealife cameras. Micro SD cards are also available for purchase.